Colin Burns is an implant dentist based at the Scottish Centre for Excellence in Dentistry. 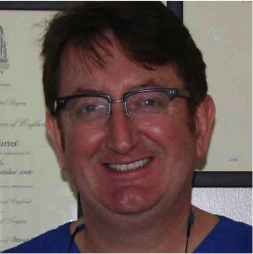 Colin is a registered ITI Mentor, ITI Speaker and is a Fellow of the International Team for Implantology. He currently sits on the Leadership Team of the ITI and is the Chairman-Elect of the Section. Colin places and restores dental implants and provides bone grafting, sinus grafting and all aspects of implant dentistry. His particular area of interest is implant surface technology, bone biology and bone regeneration, in which he achieved his MSc in Implant Dentistry from the University of Warwick. Colin qualified from Glasgow University in 1990 and received his MFDS MRCS from The Royal College of Surgeons in 2005.